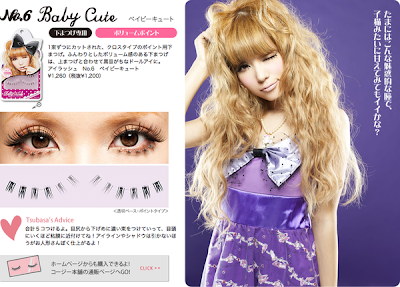 Koji Dolly Wink Eyelash (Baby cute) is a fake eyelash that is designed for the lower lash. The intertwined spread of each lash makes your lash look thicker with volume. The end of the lash is longer and denser which makes it spread like a wing of an angel. Your look will become more defined. Use it together with the false upper lash to create a look that accentuates those glamorous eyes of yours. According to your eye shape, tailor a piece of tape with a pair of tiny scissors. Clean your eyelids with cotton pads in order to remove impurities and excessive sebum. Look upward so that a lid line appears. Push up your eye lid. Stick a piece of tape on lid line that appears just now (approximately 3mm above the eye line). It should be used before makeup. Attention: the tape should not be seen when you open your eyes. More visible results are seen for those who have unapparent double-fold eyelid. For those who have single-edged eyelid, use double eyelid glue. Price: Rp. 198.000,00 ( IDR ). Hello everyone ! 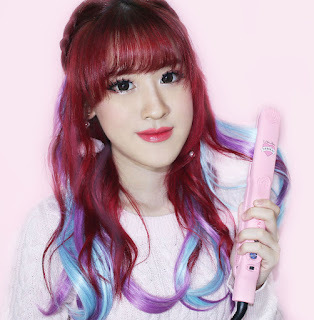 Today I am going to review another Dolly Wink product! Today is going to be Dolly Wink No6 Baby Cute, a set of false bottom eyelashes. I bought these eyelashes a good while ago, along with No1 in the series.I bought on Kay Collection SMS mall. Here is a close-up of the lashes in the box. 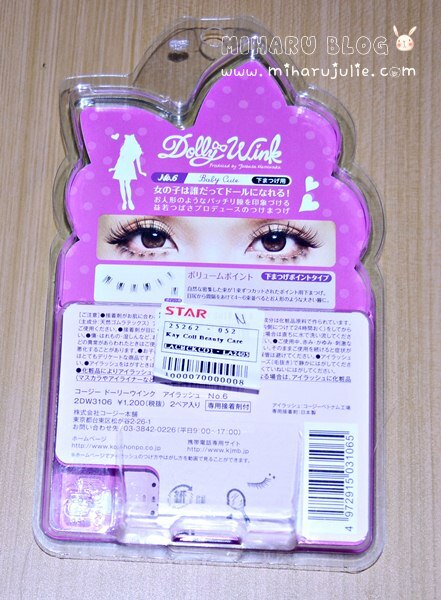 DOLLY WINK Eyelash no.6 #Baby cute. Lashes are very soft and very obvious. It look really pretty in photos. Really recommend for cosplay or modeling photo shoot. Pretty unique design and allows plenty of control, but I honestly dislike the separate sections. These lashes are very high quality. It's time consuming to put them all on lash by lash. So i'm think these falshes takes a long time to put on. Pieces can be lost easily. I only recommend this when you're going for a photoshoot / party /event. because these lashes look a little unnatural and very obvious so if you want false lashes natural, don't buy this but you can bought dolly wink no 5. They look really nice and the package is just so lovely! Oh i seeee.....:D So they sell false lashes for your below eyes part. The most natural false lashes is the no.5? This is soooo cute:) ♥ it! I really like your blog and your style..so nice! If you want I'm waiting for you on my blog!